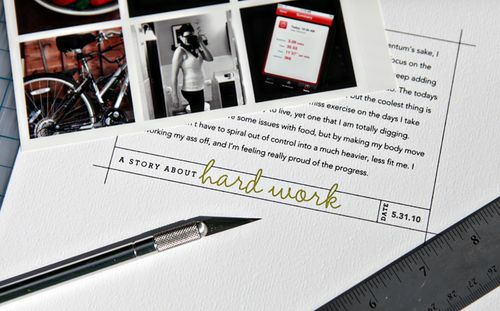 The journaling and frame parts are printed directly onto white cardstock. The photos were all printed on a single piece of 4 x 6 photo paper, trimmed out, then adhered onto the white cardstock. These new Story Cards can be used as seen in my layout, or they can also be used as photo overlays. I like the idea of using them as journaling bases, however, and that’s what I’m going to show you on this video. If you have any questions about my process, please leave me a comment and I’ll do my best to answer in a timely manner. The set includes 12 phrases. I think they’d make a nice idea for a simple photo album as well, pairing a photo with a corresponding journal card. Hybrid Digital Scrapbooking Tutorial (using StoryCards) from Cathy Zielske on Vimeo. I am loving all these hybrid ideas that makes the whole process simple and story focused. ANOTHER! You are on an inspirational roll Cathy. Loving all the new and creative ideas you’ve introduced and shared. Thank you, thank you, thank you. Thank you for a great and very inspiring tutorial.. Thank you for sharing your projects, I always learn something new. Thank you so much. AWESOME!!! and thank you for making our lives easier! The story cards are great. Thanks for the great tutorial! Cathy love the tutorial:) Thank you!!!!!!!!! You make my memory keeping so much easier!!!!!!!! Did i have widows in there? ARGH! That is a terrific tutorial! Thank you so much for explaining EVERYthing. I learned several new shortcuts, and got reminders about things I had forgotten how to do. Can’t wait to use your Story Cards set. Keep the good stuff comin’. I’ve been so intrigued by your digi products (Ali’s too) but this, story cards, ok I’ve got to figure out how to do this digi thing. These cards speak to me. I love to journal and tell the story. Is it possible to change the script word in the phrase? Or is that hard-wired? Janet, that is hard wired. so to speak. (The type has been simplifed, or rasterized.) But the font i used is Amelie. You could always buy it yourself. But, you would have to use the frame that says: us, or me, so you would have the full outline overlay! Tracy, do you have PSE? This is why i’m showing people how I do a layout that ends up being hybrid. Best of both worlds! Stunning Cathy. And you tempt me to go hybrid on occasion with that wonderful cardstock…which is? please? Cathy, love the tutorial and the story cards! Also, thanks for including the little hints on the hotkeys! They really help to simplify my digi life! Yes I do have PSE 7, just haven’t taken much time to learn. Love that you (and others) use PSE not just PS. Maureen, it’s the bazzil white op (orange peel) texture. I think it prints beautifully on my HP Photosmart. I LOVE that paper. Thanks for sharing! Great stuff! definitely going to have to snag these from DesignerDigitals. Cathy……have you ever thought about pitching a book of your great lessons. While I love watching the tutorials…..having a hard copy reference by my side would be so helpful when I actually work on a layout. I know I’d be whipping out my credit card for that purchase as soon as it became available. I love the tutorial also. I agree with Mary Mitchell that a book or downloadable step by step instructions for purchase would be so helpful. I think I will have to watch the tutorial a few times and switching back and forth will be challenging. Like you have so much time to do videos and print out instructions, but I know I would buy it if it were available. Thanks for the lesson. Loved your tutorial (and I love your style)! I learned so much from it! Can’t wait to get the StoryCards! YOU made me so happy tonight….my mind is racing with ideas. Thank you for always sharing. Thanks so much for the tutorial. You make it all look so simple. The story cards are on my wish list. I would love to know how you organize your digi elements. Thanks, Cathy. It was helpful to see you demonstrate the steps that you included in answering my question about the journaling cards in the monthly album. Now about “floating” the two documents….gonna have to watch that part again. Wow and I just promised myself I wouldn’t buy anymore digital stuff…I’m off to buy these. Thanks for the great tutorial. Oh just for all those who are using full version of photoshop..before you start tearing your hair out!! Just thought I would mention that we need to hold down the shift key when resizing the photo. Pam, right now, i don’t have the slickest system for organizing my digital elements! i need to figure that out still. I have a very basic set up: paper (cardstock); patterned paper; alpha sets; brushes & stamps; elements etc, but then whenever i go to find anything, i spend some time digging! I’ll keep blog readers posted if i figure out something really good! Yep, thanks for mentioning that! I didn’t think to tell people that. DOH! i think some of this digi malarky is finally beginning to stick thanks to you! Cathy, what is your favorite photo paper? I have an HP Photosmart also . I have beeen using their premium paper. I use Ilford Gallerie Smooth Pearl finish paper. I really have had great luck with it! Awesome tutorial, Cathy! I love learning the “insider” tips. 😉 I think you could do a Big Picture class with all these hybrid lessons. I’d definitely sign up for that! I totally agree with Janel……I think another BPS class is in order…..Hybrid scrapbooking !!! My biggest scrapbook projects every year are travel albums and a family album of our year long events and activities. I’m doing pretty good with the basic digi layouts….even though I haven’t tried importing digi paper yet?. I’m really stuck on the hybrid stuff…maybe because I’m using a PC and when you start throwing out those key functions they don’t make sense to me. I know you try and give both Mac and PC options….but often I watch the tutorials and think…..HUH???? I’d second the step-by-step instruction manual. I desperately try to write down steps as you go thru them. Though things are getting a little easier after having done a few of your BPS classes. But there is always something I get stuck on & then it’s endless frustration searching for the sol’n which is usually a “‘DUH’ how easy was that” moment. Cathy, I agree with Mary and the others….a written form of your instructions would be INVALUABLE. Thanks to this video I’m going to try digital – hybrid anyway. I have PSE 6 but since I love working with actual paper & photos I haven’t tried much with the program. I love your story cards – just bought them and my summer project will be to use them all. THANK YOU, THANK YOU, THANK YOU. Janel, that’s a great idea! Rita, duly noted! : ) I will keep this in mind for future tutorials. Any chance, anyone is going to write up instructions for this video (which is totally awesome) and then share them with the world? Cathy, would this be ok with you? I’d volunteer myself but I’m SUCH a newbie at all this digital that I’m afraid it’s going to take me forever to write it up and I have no idea how I would get it to anyone else. Just a thought…..
Hey, what do we lazy scrappers have to do to get you to make a Shutterfly book for us? Do we need to needle you? Shutterfly? Who? I’ve been waiting for a long time and still nothing. Please help, I do digi scrap and traditional scrap but sometimes and more so lately I just want to upload to Shutterfly and there aren’t enough graphic style choices to choose from. Please assist. Stephi, do you mean of this layout? or just in general? I have one album set “Message to my Girl/Boy” that can be used for a Shutterfly album, but at this time, i don’t design for Shutterfly, if that makes sense.